Dissatisfied with the gameplay of the PC version of GTA Online, a group of modders built a service that let them host custom multiplayer variants. Now, they’re finding themselves permanently blocked from playing Grand Theft Auto V and other games published by GTA maker Rockstar. 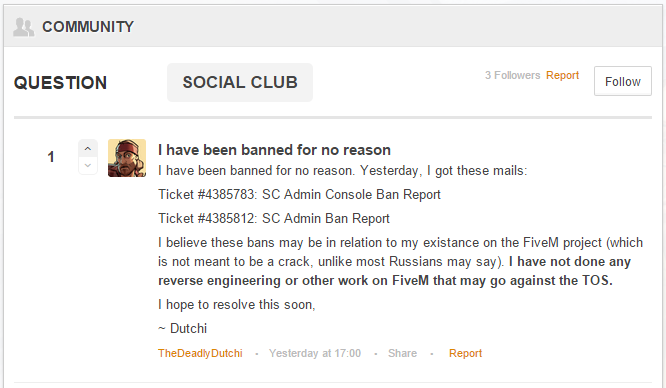 It seems that NTAuthority and TheDeadlyDutchi were also banned. Dutchi has used mods before (but a very long time ago) and (as far as I know) NTA has never used single player mods (besides creating FiveM, of course). I found this out today, not too long before I started writing this post. I am not a developer of FiveM, I am just the mere moderator of the subreddit, but yes, I have some sort of affiliation with the mod. I was skeptical that we were banned (screenshot) for being contributors (in some way) to the FiveM project. NTAuthority and TheDeadlyDutchi was banned on Thursday as well... surprise surprise. I asked Dutchi what time he got the email... 1:52am. We were banned within two minutes of each other. It was certainly a manual ban. 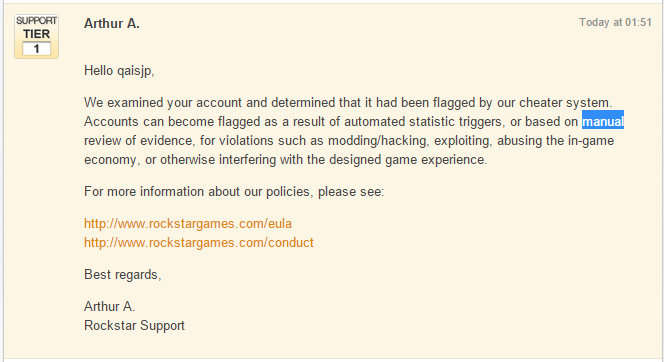 This completely rules out the possibility that I was banned for single player mods - the good news is that Rockstar doesn’t seem to be banning people for just using single player mods. The bad news is that Rockstar is trying to stifle the modding community. PC players need to log into Rockstar Social Club to play any part of GTA V, so qaisjp and the other users have effectively been barred from accessing that game, as well as any others linked to those Social Club accounts. We have always appreciated the creative efforts of the PC modding community and we still fondly remember the awesome zombie invasion mod and original GTA map mod for GTAIV PC among many other classics. To be clear, the modding policy in our license has not changed and is the same as for GTAIV. Recent updates to GTAV PC had an unintended effect of making unplayable certain single player modifications. This was not intentional, no one has been banned for using single player modifications, and you should not worry about being banned or being relegated to the cheater pool just for using single player PC mods. Our primary focus is on protecting GTA Online against modifications that could give players an unfair advantage, disrupt gameplay, or cause griefing. Many of the angrier posters in the Reddit thread say that there’s a disconnect between Rockstar’s previous statement and current policing action because FiveM doesn’t connect to or interact with GTA Online. Kotaku has contacted Rockstar for comment on this story and will update this post if they respond.